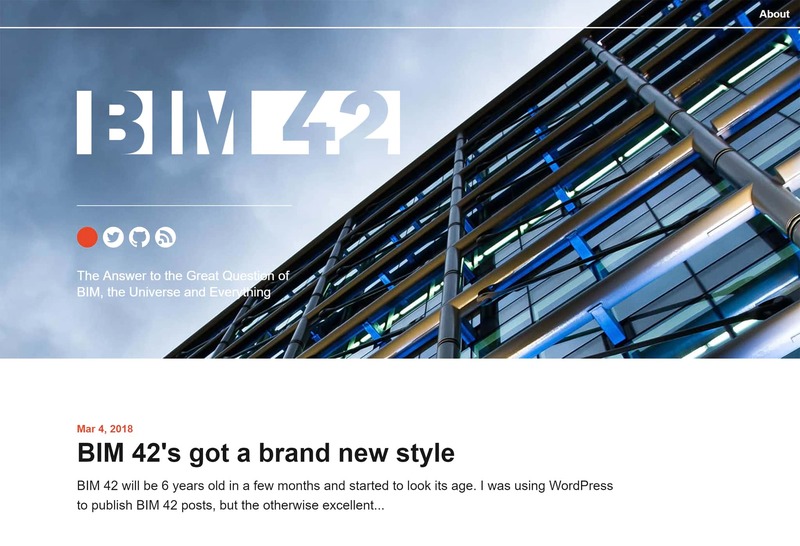 BIM 42 will be 6 years old in a few months and started to look its age. I was using WordPress to publish BIM 42 posts, but the otherwise excellent CMS was starting to feel too cumbersome for my taste. I wanted something more mobile-friendly and my growing interest into web technologies had me questioned the technology stack of this blog. After some thoughts, I decided to rebuild BIM 42 as a static website, without any database or server-side code. Do to so, I use the static site generator Jekyll, who to transform simple plain text files into a website. I host the resulting website on Github Pages. The only feature that requires a server are comments, I am using the third-party service Just-Comments to manage them. The migration is now almost complete, but you might still encounter a few mistakes here and then, I hope to correct them in the next few days. Along with the infrastructure change, I also change a few things, like a new, more modern design and a refreshed About page Don’t hesitate to share your thoughts about this new version, I would be happy to hear your advices.